I love Mondays. While most people dread it, I look forward to it every week. For most people Monday’s are the start of the work week, for me it’s my Sunday. On Sunday nights, I read through cookbooks for inspiration on what to create for Monday’s dinner. On Mondays, I go to a quiet Granville Island to shop in the market at my leisure. During half the year, I have dragon boat practice on Monday’s, so I prepare most of the meal in advance. Since I’m starving when I come home from practice, I either need to choose a meal that I can make to the point where the last steps of preparation takes less than 15 minutes, (about the maximum time I can wait after I get home) OR leave the mostly prepped meal with explicit instructions for Ben on how to complete it. I’ll put it out there now, Ben is not feeble in the kitchen. I am just a kitchen nazi. On this particularly cold Monday, I chose to make bouillabaisse. I knew I wanted something that would warm my soul after a cold night on the water, and this recipe suits the bill perfectly. 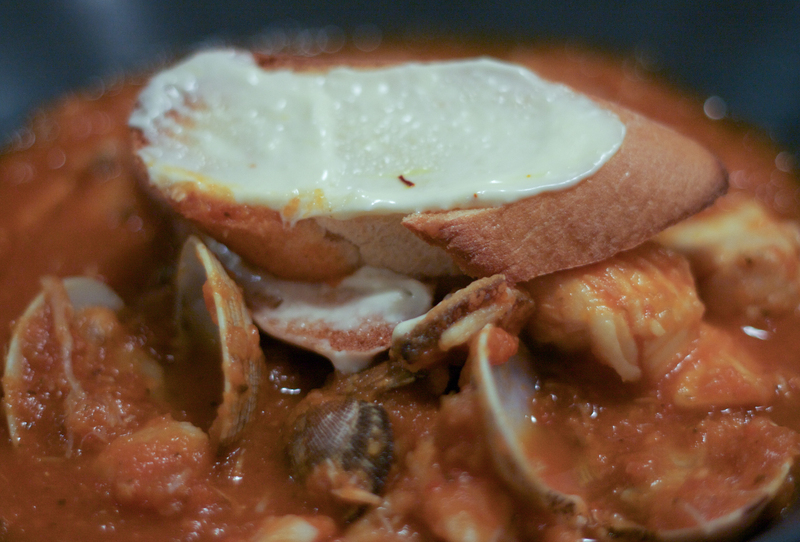 My recipe for Monday night bouillabaisse, based on a Jamie Oliver recipe. Heat a large pan with olive oil. Add all base ingredients and slowly fry for 40 minutes, covered with a cartouche, (a parchment paper lid placed directly onto the cooking veggies, aluminum foil works just as well). Remove the cartouche and turn the heat up to caramelize until coloured. Keep stirring to prevent the veggies from sticking to the pan. Bring to a boil, turn the heat down and simmer gently for 1hr. When the soup’s ready use an immersion blender to smooth out the soup to the consistency of your preference. At this point I stir in a tablespoon or 2 of harissa, so I can taste the hint of heat, but it’s not overwhelmingly spicy. That’s how I like it, you can omit it or add more if you want. The fish – 4 kg of whatever looks good… I go to Brian or Ray down at Seafood City in Granville Island and tell them I’m making bouillabaisse and to give me whatever’s good that day. For tonight’s dinner I got some bay scallops, clams and halibut pieces. I had the crab leftover in the freezer from a fishing trip to Tofino last fall. 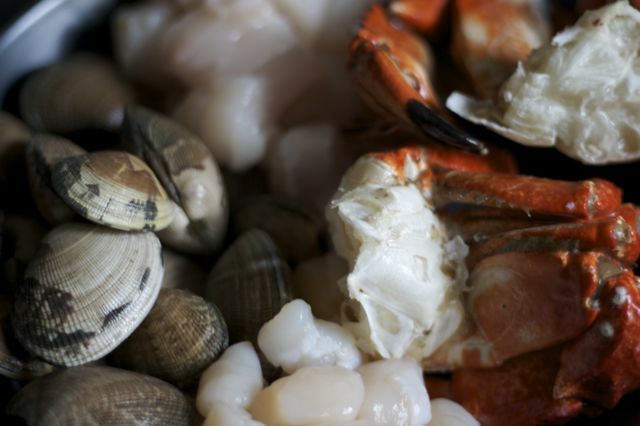 Add the seafood to the soup in order of how long it’ll take to cook. A Monday night treat! Too bad I forgot to add the saffron to the aioli. i made it but it tasted bland… like vegetable soup with fish in it…? granted, i didn’t put any chili in it…. That’s so sad, especially because I love it so much! What type of fish stock did you use? And fish? 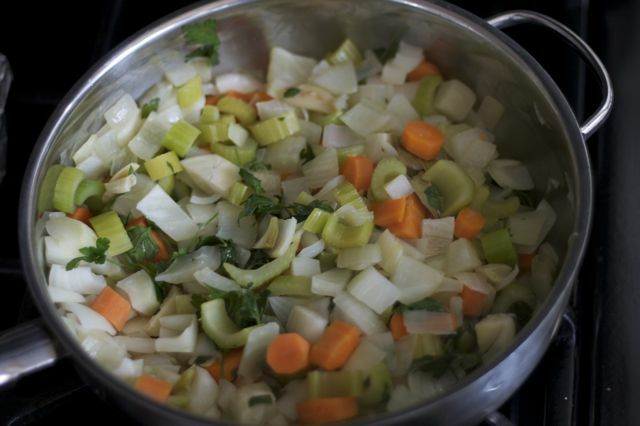 I find that it you really caramelize the veggies before and then add a good fish stock, the base tastes pretty darn good, but when you add the fish and let it all cook into the soup, it imparts such a wonderful flavour. Thanks for your comment. The bouillabaisse is one of my favourites and I love how adding different fish results in different flavours each time I make it. Happy cooking to you too! I made this tonight! Yum yum. We go fishing allot so I just used cod and flathead. The chilli makes the dish. I also swapped leak for green spring onion and didn’t use fennel and was still beautiful.